Lost Galleon is continuously striving to offer our customers the finest quality, selection, and value in fine handcrafted treasure coin jewelry. We have been in the treasure business for 25 years and specialize in rare high grade pieces from Ancient Greece, the Roman Empire, sunken Shipwreck Treasure and more. Every treasure item offered on our website is absolutely genuine and has our Lifetime Guarantee of Authenticity. Knowing the particular history of each coin is a must, so each item comes with an informative Lost Galleon Photo Certificate of Authenticity and treasure area map. We invite you to explore our extensive collection of historical coins beautifully crafted by our master goldsmith into a wide variety of exceptional jewelry styles. As you may imagine, our selection is ever changing and every piece that we sell is one of a kind! My passion for shipwreck treasure began in the early 1990's when I began diving for artifacts and sunken treasure in the Caribbean. In 1994, I and a fellow diver opened The Pirates Chest in St Thomas, which became one of the largest sellers of authentic treasure coins in the Caribbean. As a PADI Divemaster and licensed Captain, I dove extensively on shipwreck sites for over 12 years while living in the Caribbean Islands recovering hundreds of artifacts from the Colonial period. 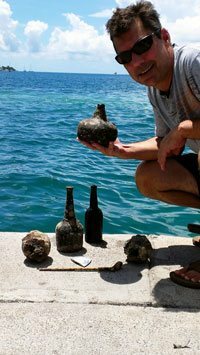 All of the shipwreck pottery we offer was found on some of our favorite wreck dive sites in the Caribbean. Treasure hunters and those lucky enough to just happen upon long lost fortunes continue to make exciting finds around the globe. Lost Galleon works diligently with numerous treasure salvagers, auctions and other worldwide sources to obtain these rare and fascinating historical pieces. We acquire every treasure piece for its uniqueness, quality and historical significance. 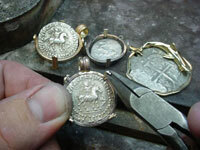 Each coin is carefully custom framed into a variety of distinct jewelry styles by our master goldsmith. 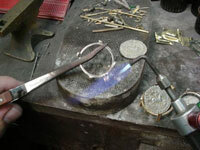 It is extremely important to us that the treasure coins are not altered or damaged during the jewelry setting process. We believe in preserving the history and value in our rare jewelry so that it can be displayed for all to see. I hope that you enjoy exploring the many exciting pieces of history on our website and that you discover your one of a kind treasure here. Lost Galleon is dedicated to our customers' satisfaction. Please contact us with any questions you may have, or view our FAQs or Customer Service, Returns & Policies.